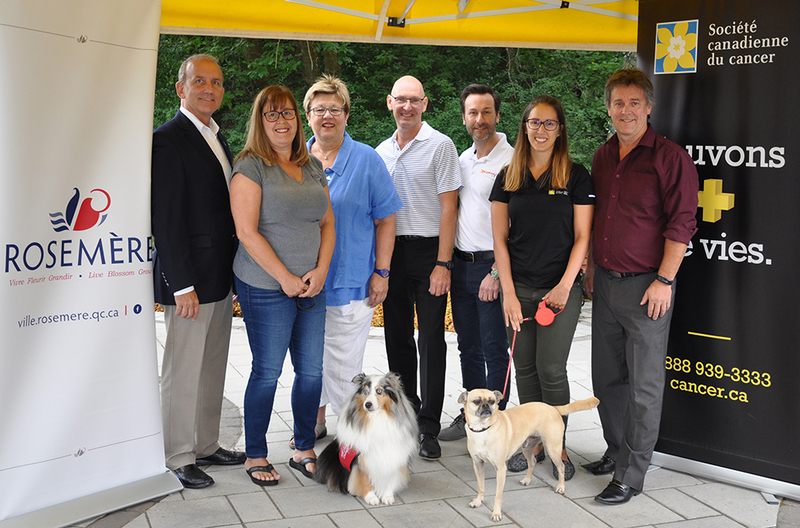 On Sunday, September 24, the Town of Rosemère, in collaboration with the Canadian Cancer Society (CCS), is inviting residents to take part in the 19th edition of the Paws For Hope walk-a-thon—a fund-raising activity where participants are invited to walk along a specified route with their dog. This activity helps save more lives, one step at a time. The annual event—sponsored province-wide by Mondou—will be taking place in Rosemère for the very first time, along the traditional Rosemère en santé route. The point of departure will be at Hubert-Maisonneuve school, located at 364 Académie. Rosemère Mayor Madeleine Leduc is the patron of this first edition. "I am very pleased to be presiding over this event, which is a simple, fun way of raising funds for a good cause. I am inviting all Rosemerites to take part in this walk-a-thon with their family or friends and their faithful, four-legged companion." To take part, a $10 registration fee per dog is required and each walker collects donations, before the event, on behalf of his or her pet. The participant comes to the event (which will be held rain or shine) all prepared to walk 3 or 5kilometres, in a friendly, family atmosphere. The minimum fund-raising amount suggested is $100 per pet and $50 per additional dog. To participate or to make a donation, go to Paws for Hope website. With the support of 300,000 annual donors and 30,000 volunteers, the Canadian Cancer Society (CCS) is the cancer charity in Quebec that has the greatest potential to save more lives. Every year, some 135,000 Quebecers turn to this organization. The CCS is therefore doing its utmost to increase the overall cancer survival rate, which currently stands at 63%, to 80% 2030. Together, let’s save more lives!